There really wasn’t much trouble in Nottingham Hill and none at all in Kensington, so I expect your pub is okay. What makes it your favourite? Glad to hear that, and to hear from you! Any dust-up in Oxford yet? It’s really a rather ordinary-looking pub inside, but the exterior is glorious! 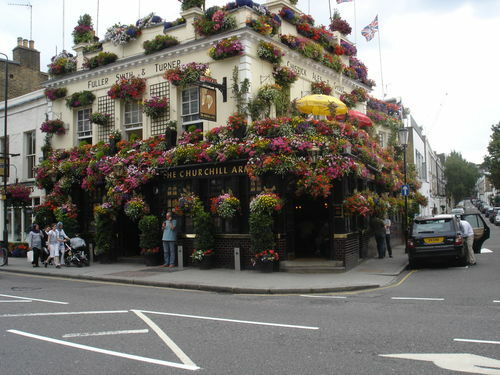 A lot of pubs have greenery, but the Churchill Arms is really splendid. And it’s on a lovely street, full of antique shops and such. I’d make a point to get off the tube at Notting Hill Gate just to walk down it!